Our Judge’s Favorite winner of the 2013 Science of Pie event showed how beer and vodka affect pie crust color and texture. But they weren’t the only students who experimented with alcohol in their pies. Two other teams—Team Super Rum and the Beam Team—also used alcohol to create flaky, tender crusts. The Beam Team even added Kentucky bourbon whiskey (Jim Beam, of course) to their pie filling for an extra punch of flavor. There’s another (more scientific) reason for boozing up a pie crust: alcohol creates a more tender, flaky crust than can be easily achieved with water alone. This happens because alcohol and water have very different effects on the formation of springy gluten networks in pie dough. Gluten develops when two wheat proteins in flour, glutenin and gliadin, are mixed with water. Because parts of these proteins do not like to interact with water, the proteins begin to stick to each other much in the same way oil droplets come together when suspended in water. As a flour-water dough is mixed, the glutenin and gliadin molecules interact to form an extensive elastic network . Gluten development during dough formation. Scanning electron micrographs of gluten networks during early (A), middle (B), and late (C) stages of dough mixing . The development of these gluten networks requires water. While gluten networks are great for chewy bread dough, they are less than ideal for flaky, tender pie crust. An ideal pie dough has as just enough gluten to hold everything in the dough together. And while gluten development can be minimized by adding only scant amounts of water and handling the dough as little as possible, this is easier said than done. A more practical solution is to replace some of the water with a liquid that does not promote gluten formation. Unlike water, alcohol inhibits gluten formation. By interacting with the gluten proteins, alcohol molecules limit their ability to stick to each other and form springy networks . Using alcohol in the place of water allows more liquid to be added to the dough while still restricting gluten formation. This results in a softer, more pliable dough that becomes tender and flaky when baked. 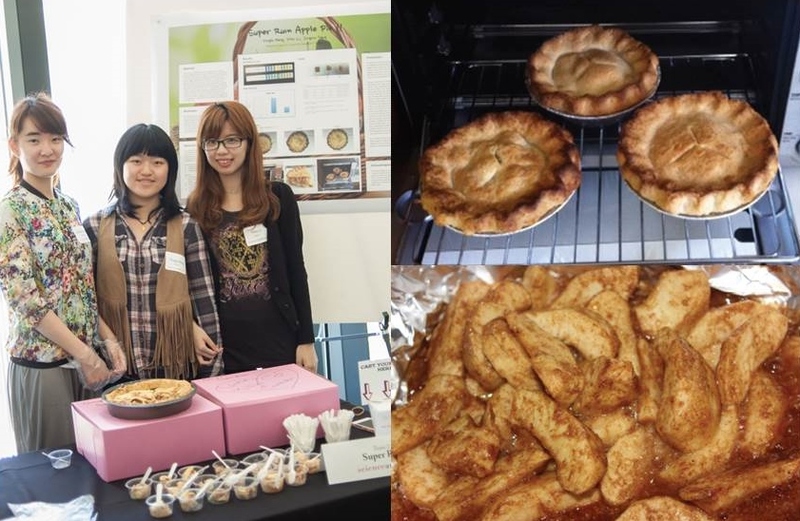 Team Super Rum serves their pie and presents their work at the Science of Pie even (left). Test pies made with rum pie crust (top right) or bourbon apple filling (bottom right). Like the recipe below, the Beam Team paired a vodka pie crust with a decadent bourbon and apple filling. Although vodka is typically used for its subtle flavor, any type of alcohol will prevent gluten formation. As their name suggests, Team Super Rum used rum instead of vodka to create a flaky and uniquely flavored crust. And we bet there are many more delicious possibilities in the realm of alcohol-based pie crusts. If you try this recipe with something other than vodka, share your new pie crust concoction with us in the comments below! Process 1 1/2 cups flour, salt, and sugar in a food processor until combined, about 2 one-second pulses. Add butter and shortening and process until homogeneous dough just starts to collect in uneven clumps, about 15 seconds (dough will resemble cottage cheese curds and there should be no uncoated flour). Scrape bowl with rubber spatula and redistribute dough evenly around processor blade. Add remaining cup flour and pulse until mixture is evenly distributed around bowl and mass of dough has been broken up, 4 to 6 quick pulses. Empty mixture into medium bowl. Preheat oven to 425. Place bottom crust in pie plate. Peel, core, and halve the apples. Cut into 1/4-inch thick slices, about 7 or 8 cups. In a 4 quart saucepan, whisk together sugar, flour, cinnamon, nutmeg, and salt. Whisk in bourbon whiskey and lemon juice until evenly blended. Cook over medium heat, whisking frequently until the mixture boils and thickens slightly. Add apples and stir until evenly coated. Continue cooking, stirring continuously, for 3 minutes. Set aside to cool, stirring once or twice for 20 minutes. Pour apple mixture into the pie shell, mounding apples slightly in the center. Dot with butter and add the top crust. Cut several steam vents into top crust. Bake 25 minutes at 425. Reduce temperature to 350 and bake 45 minutes longer or until crust is brown and juices are bubbling. Serve warm or chilled with whipped cream or ice cream. Technology of breadmaking (2007). 2nd ed. New York: Springer. 397 p.
Amend T (1995) The mechanism of dough forming: Efforts in the field of molecular structure. Getreide Mehl Brot 49: 359–362. Tags: alcohol, apple pie, bourbon, chemistry, foraging, gluten, pie, pie crust, vodka. Bookmark the permalink. What effect would alcohol have on a pie crust made from a gluten-free flour? I suppose it depends on the particular flours used. But would it have a positive affect in terms of tenderness/flakiness or just make it not hold together? In a traditional pie crust, the alcohol makes a tender, flaky crust by inhibiting gluten formation. Because a pie crust made from gluten-free flour has no gluten to develop, we wouldn’t expect the alcohol to have much of an effect one way or the other. You bring up a really good point here. While limiting gluten formation creates a more tender crust, completely preventing gluten formation would also prevent the dough from holding together. In general, gluten-free recipes have to get around the lack of gluten by using different types of molecules to hold things together. For example, recipes might add ingredients like eggs, tapioca starch, or xanthan gum to help bind the dough. Would this type of cooking (using alcohol as wet ingredient) help Celiac patients? I just might experiment with some190 proof and glycerin to make biscuits…cooked at a low temp of course! Using alcohol to inhibit gluten network formation does not make make a dough safe for Celiac patients or any one else with serious gluten intolerance. The way the term “gluten” is used can be a bit confusing. So-called “gluten development” during the process of dough formation specifically refers to the development of springy protein networks made out of wheat proteins called glutenins and gliadins. These springy gluten networks are what give bread a nice, chewy texture. However, when we say that someone like a Celiac patient is “gluten intolerant,” what we really mean is that they are sensitive to the individual proteins, such as the gliadins, that make up gluten. Simply limiting “gluten development” will not make a food safe for a Celiac patient because these problematic proteins will still be present. Using “gluten-free” flours and products are the most effective way to make foods safe for Celiac patients. Shortening? Seriously. Shortening? That product created to make CANDLES at the turn of the last century? UCLA where are your nutrition experts? I’m totally bummed you are telling people to eat shortening. 😦 I’ll replace it with chilled coconut oil and see what happens. So far coconut oil has been the perfect replacement one to one for every recipe I’ve tried. Still can’t believe you guys are using shortening in 2013. Made this, both crust and filling with Calvados: the apple cognac from Normandy. (Père Maglore brand). This is called, I think, “apple jack” over your way. AND, using the info from another article about the winning pie using Perrier, I used Calvados with our local naturally fizzy mineral water, similar to Vals and Badoit (in the Ardèche, France). Served with “café calva”, which is expresso and a shot glass of Calvados, some of it added right into the (usually sweetened) demi-tasse. OF COURSE used butter, not shortening (uge! ), but the cold coconut oil sounds good too. I use local raw butter that I keep in the freezer.